Bastida, Ramon and Mas-Machuca, Marta 2019. Handbook of Research on Value Creation for Small and Micro Social Enterprises. p. 151. Vantilborgh, Tim and Van Puyvelde, Stijn 2018. Volunteer Reliability in Nonprofit Organizations: A Theoretical Model. VOLUNTAS: International Journal of Voluntary and Nonprofit Organizations, Vol. 29, Issue. 1, p. 29. Molina, José Luis Valenzuela-García, Hugo Lubbers, Miranda J. Escribano, Paula and Lobato, Marta M. 2018. “The Cowl Does Make The Monk”: Understanding the Emergence of Social Entrepreneurship in Times of Downturn. VOLUNTAS: International Journal of Voluntary and Nonprofit Organizations, Vol. 29, Issue. 4, p. 725. Brolis, Olivier Courtois, Marie Herman, Ginette and Nyssens, Marthe 2018. Do Social Enterprises Discriminate Less Than For-Profit Organizations? The Influence of Sector and Diversity Policies on Managers’ Prejudice Toward Immigrants. Nonprofit and Voluntary Sector Quarterly, Vol. 47, Issue. 4, p. 745. Cieslik, Katarzyna 2018. The quandaries of social entrepreneurship studies – a discursive review of the discipline. Review of Social Economy, Vol. 76, Issue. 3, p. 352. Tekula, Rebecca and Andersen, Kirsten 2018. The Role of Government, Nonprofit, and Private Facilitation of the Impact Investing Marketplace. Public Performance & Management Review, p. 1. Taylor, Barrett J. Barringer, Sondra N. and Warshaw, Jarrett B. 2018. Affiliated Nonprofit Organizations: Strategic Action and Research Universities. The Journal of Higher Education, Vol. 89, Issue. 4, p. 422. Ishida, Yu 2018. Global Encyclopedia of Public Administration, Public Policy, and Governance. p. 792. Yu, Jianxing and Chen, Kejian 2018. Does Nonprofit Marketization Facilitate or Inhibit the Development of Civil Society? A Comparative Study of China and the USA. VOLUNTAS: International Journal of Voluntary and Nonprofit Organizations, Vol. 29, Issue. 5, p. 925. Horvath, Aaron Brandtner, Christof and Powell, Walter W. 2018. Serve or Conserve: Mission, Strategy, and Multi-Level Nonprofit Change During the Great Recession. VOLUNTAS: International Journal of Voluntary and Nonprofit Organizations, Vol. 29, Issue. 5, p. 976. Nilsson, Andreas and Robinson, David T. 2018. What Is the Business of Business?. Innovation Policy and the Economy, Vol. 18, Issue. , p. 79. Clausen, Josephine Bayle, Emmanuel Giauque, David Ruoranen, Kaisa Lang, Grazia Schlesinger, Torsten Klenk, Christopher and Nagel, Siegfried 2018. International sport federations’ commercialisation: a qualitative comparative analysis. European Sport Management Quarterly, Vol. 18, Issue. 3, p. 373. Maher, Chi 2018. Handbook of Research on Entrepreneurial Ecosystems and Social Dynamics in a Globalized World. p. 126. Fitzgerald, Tricia and Shepherd, Deborah 2018. Emerging Structures for Social Enterprises Within Nonprofits: An Institutional Logics Perspective. Nonprofit and Voluntary Sector Quarterly, Vol. 47, Issue. 3, p. 474. Robichau, Robbie Waters and Wang, Lili 2018. Marketization strategies and the influence of business on the management of child welfare agencies. Human Service Organizations: Management, Leadership & Governance, Vol. 42, Issue. 2, p. 146. Gupta, Sachin Palsule-Desai, Omkar D. Gnanasekaran, C. and Ravilla, Thulasiraj 2018. Spillover Effects of Mission Activities on Revenues in Nonprofit Health Care: The Case of Aravind Eye Hospitals, India. Journal of Marketing Research, Vol. 55, Issue. 6, p. 884. 2018. Influence of Public Policy on Small Social Enterprises. p. 1. Gatica, Sebastian 2017. Shaping Social Enterprise. p. 169. Besana, Angela 2017. Factors Affecting Firm Competitiveness and Performance in the Modern Business World. p. 223. Nonprofit organizations are increasingly resembling private firms in a transformation bringing with it a shift in financial dependence from charitable donation to commercial sales activity. This book, first published in 1998, examines the reasons and consequences of the mimicry of private firms by fundraising nonprofits. User fees and revenue from 'ancillary' activities are mushrooming, with each having important side effects: pricing out of the market certain target groups; or distracting the nonprofit from its central mission. 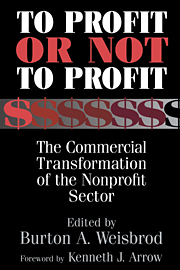 The authors focus first on issues that apply to nonprofits generally: the role of competition, analysis of nonprofit organization behavior, the effects of distribution goals and differential taxation of nonprofit and for-profit activity revenue, the effects of changes in donations on commercial activity, and conversions of nonprofits to for-profits. They then turn to specific industries: hospitals, universities, social service providers, zoos, museums, and public broadcasting. The book concludes with recommendations for research and for public policy toward nonprofits. 7 - Conversion from nonprofit to for-profit legal status: Why does it happen and should anyone care? 12 - Commerce and the muse: Are art museums becoming commercial?